Network Security That Keeps Your Company Safe! Would you leave your doors and windows unlocked, leave town, then announce as much on Facebook? You’d be surprised how many businesses unwittingly do this. There are myriad entry points into computer networks and many of them published freely on the internet. Email, web browsing, file transfer protocols (FTP), and remote access methods all need to be secured. Are you leaving doors large enough to drive a bus through wide open? INCS helps clients identify these wide open doors (vulnerabilities), and helps secure them, often for compliance purposes. Small businesses often are targeted because they typically are less likely to employ best practice for network security. 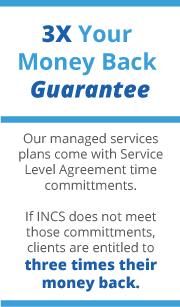 With INCS, it doesn’t have to be that way anymore. With our Enterprise Class Security approach, small- to medium-sized business can leverage network security practices used by large corporations that previously seemed cost-prohibitive. Security shouldn’t slow down your business or prevent your team from using the resources needed to do their jobs. And it certainly shouldn’t make your clients wonder if their information is safe with you. We find the right balance between protection and functionality.